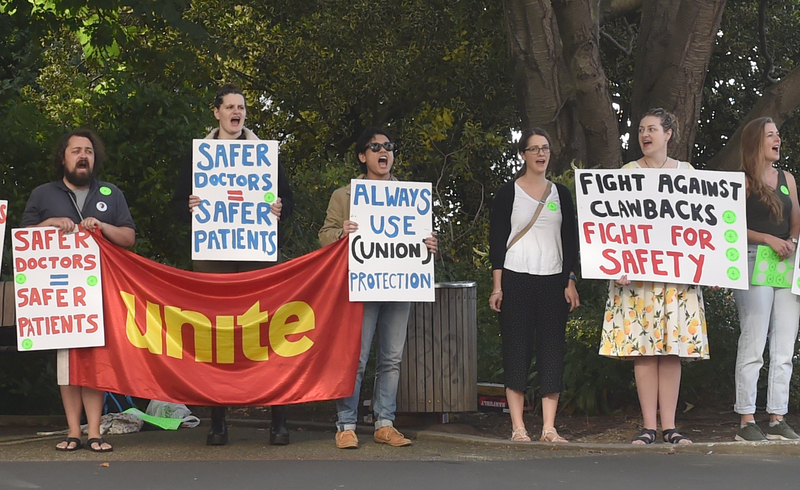 For the third time this year, Dr Rosa Tobin Stickings has spent her morning protesting outside Dunedin Hospital. It is not how the house officer wants to be doing - she would far rather be inside treating patients. But the ongoing dispute between the Resident Doctors Association (RDA) union and district health boards today saw junior doctors begin their third nationwide 48-houtr strike in the past six weeks. "I signed up for a career of looking after patients and helping people who are sick - I didn't want to be fighting to have a reasonable working life,'' Dr Tobin Stickings, who is an RDA a local organiser, said. DHBs want to vary existing "safe staffing'' rosters to allow greater flexibility, while the RDA bitterly opposes any alteration to work conditions. Mediation talks between the RDA and DHBs resume later this week, but the union has filed notice of a fourth strike on February 26 and 27. "We are always optimistic that this will be our last strike and we won't have to do it again,'' Dr Tobin Stickings said. "We don't take striking lightly, it is not something that we want to do, we don't like to walk away from the job. Earlier, Dr Tobin Stickings said there was no such thing as an "average'' working day. "On a day shift we start between 7.30am and 8.30, and in theory we finish around 4.30pm. A 15-hour shift is not unusual, and meal breaks are usually short and snatched between seeing patients - often they are skipped entirely. "If you started at 7.30am and you are still there at 11.30 at night, that's a long stretch,'' Dr Tobin Stickings said. "After that 4.30pm cut-off, you are the only house officer looking after a whole chunk of patients, and you can be run off your feet - and then you have to be back by 7.30 to do it all again. The Southern District Health Board - which had to deal with a midwives' strike and a two-hour stopwork by administration staff yesterday - said it was ready for the third strike by RDA members. "Our hospitals remain open and patients should still come to their scheduled appointment or surgery on those days, unless we have contacted them directly to say their appointment is being rescheduled,'' chief executive Chris Fleming said.